MEDIUM: "brass smoothed and polished to the point where the materiality of the sculpture is dissolved in its reflective luminosity." 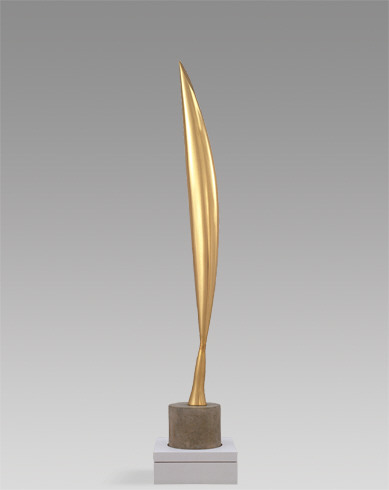 The bird theme represent an axis in the universe of Brancusi's ouvres. His obsession for capturing the essence of flight begun with "Maiastra" sculptures, followed by Golden Bird group, and, finally, the Bird in Space series. According to S. Geist, sixteen examples of "The Bird in Space" series , dating from 1923 to 1940, have been identified. PURPOSE: Probably a Bactiran stone ritual object. I am fascinated by this (probably) ritual objects,they are subject to my ongoing research, I hope to publish soon my findings.